Russia’s Internet giant Yandex continues its experiments with UI. 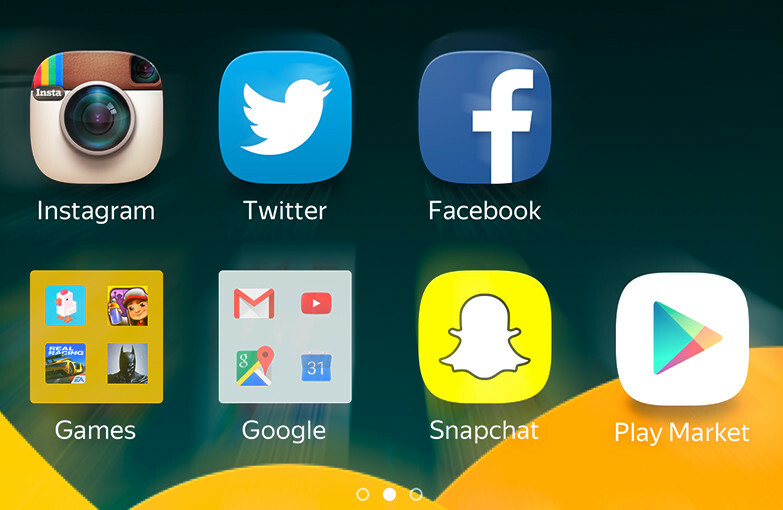 Less than a year after releasing its own browser, the company has announced a new product, Yandex Launcher that targets low-end devices running Android. Currently the launcher is available for users in Latin America, where low-end smartphones make up most of the sales and people are “more eager to try something new than elsewhere,” Yandex spokesperson Vladimir Isaev told TNW. New regions will be rolled out gradually in the future, with fine adjustments in the app recommendation system, one of the launcher’s core features. Yandex’s new product for Android shows, among other things, the company’s continuing determination to become a notable player on this platform. That chimes along with its ongoing legal battle with Google in Russia. Back in February, Yandex accused Google of anticompetitive practices aimed at making it impossible for Yandex to pre-install its services on Android smartphones. Recently, the Russia’s antitrust authorities sided with Yandex and ordered Google to unbundle its search and other services, allowing hardware vendors to pre-install any third-party apps. In addition to that, Google will be fined “from 1 percent to 15 percent of the turnover of the pre-installed apps market in 2014.” Apparently the ruling is a good signal for Google’s main Russian competitor to keep working on Android products. Getting back to the launcher, it has quite a bit of interesting features that you won’t see in its most popular competitors. That, first of all, is the possibility to group apps by the icon color. Although the idea has been implemented a few times in not very well-known launchers, Yandex seems to be the first who’s done it right. Another way to group the apps is by their Google Play category. The list of categories is place on top of the app list and can be easily customized. When you choose any category from the list, the launcher will recommend you other apps that could be worth your attention. “We use our own recommendation technology that is also included in Yandex’s other products: for example, it compiles personal, taste-based playlists in Yandex.Radio,” Isaev said. If you don’t like an app recommended by the launcher, you can show it by tapping and holding on the recommendation. “The engine is based on machine learning mechanisms, so its recommendations will improve over time,” said Isaev. Another noteworthy part of the launcher is the Quick Access screen, which opens up when you tap the search bar or swipe down anywhere on the screen. It shows frequently accessed websites, apps, and contacts together. The search box on top lets you look for contacts and apps (both on the phone and in Google Play), as well as search the web normally. Apart from the color grouping and recommendations engine, Yandex’s product is a good lightweight alternative launcher for Android, although it lacks deeper customization possibilities. To name a few limitations, you can’t change the number of icons in the drawer or the distance between the icons on the desktop. You also can’t remove icon labels. Yet after all, the launcher is supposed to be as simple as possible to work on very limited resources, which it does admirably, taking just 6.5 MB of space on the smartphone. What you can do is change wallpaper (obviously), create folders with custom backgrounds, adjust the icon grid and choose a desktop transition effect. You can also turn on and off the search widget and choose what search engine you want it to be tied to. For Latin America, Yandex humbly offers a choice between Google and Bing. As opposed to Yandex.Browser and many other projects of the Russia’s internet behemoth, the launcher is a product with a clear monetization model that should be able to make profit at some point. The business model is to monetize the recommendation engine in together with mobile advertising networks, some of which have already partnered with Yandex. After receiving the first feedback from customers in Latin America, Yandex plans to adjust the launcher and roll it out in other regions, including Russia, Europe and the US.